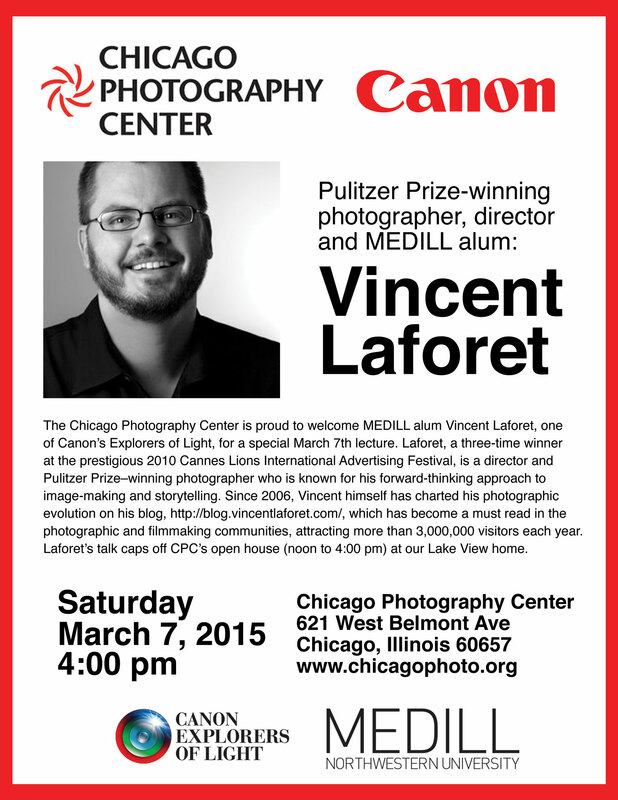 The Chicago Photography Center is hosting the magnificent Vincent Laforet at the Center on March 7th. Mr. Laforet comes to CPC as a Canon Explorer of Light, and will give a keynote talk at 4pm. Vincent, a three-time winner at the prestigious 2010 Cannes Lions International Advertising Festival, is a director and Pulitzer Prize-winning photographer who is known for his forward-thinking approach to image-making and storytelling. In addition to having been commissioned by just about every important international publication—including Vanity Fair, The New York Times Magazine, National Geographic, Sports Illustrated, Time, Newsweek, and Life—Vincent is considered a pioneer both for his innovative tilt-shift and aerial photography and in the field of HD-capable DSLR cameras. In fact, his short film Reverie, the first 1080p video shot with a still camera, was seen by more than 2 million times on the first week of its release in 2009. He’s also an alumnus of the Medill School at Northwestern University. The Chicago Photography Center is located on 621 W. Belmont Ave. in Chicago, in the old Parish House of St. Peter’s Episcopal church. More details on the CPC open house can be found on this flyer.